Little known fact: I am a jigsaw puzzle enthusiast. I love spreading all the pieces out, finding the straight pieces and building the frame, organizing the rest into groups by color or content, figuring out where they go, and watching the image emerge bit by bit. Putting the last piece in place is uniquely satisfying. A bow on a gift. 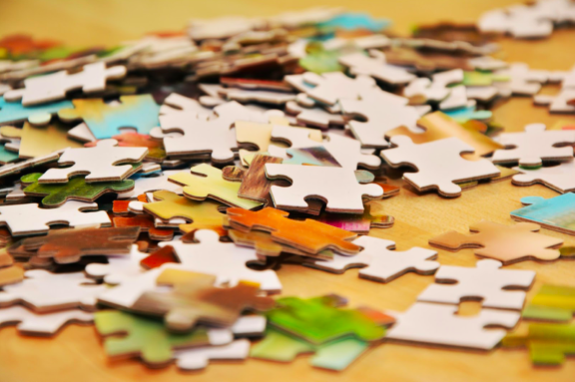 When I think about it, designing a book or marketing brochure is much like solving a jigsaw puzzle…except I don’t know what the finished product will look like when I start. So that’s the real challenge, the thrill of the hunt. But the process is fairly methodical, punctuated by bursts of creativity to solve design problems along the way. So like a puzzle, my first step is to spread out all the elements of a project, sorting and organizing as I go. The size and shape of the finished piece may be predetermined, but if not, that is one of the first decisions to make, thereby providing a structure and direction — the frame, if you will — for the design process. Next, I start finding homes within that framework for the copy, photos and other graphic elements, dressing them in just the right font, color, cropping and yes, even white space. The puzzle is taking shape. The image is emerging. Through proofing and feedback, the client often adds a few pieces to the puzzle too. Sometimes a piece we thought was in the right place turns out to not be an exact fit , so it gets moved. And unlike a puzzle with its set number of precut pieces, that element we moved might need to be reshaped or not used at all. When the project nears completion, the process seems to speed up as the pieces fall into place almost of their own accord. Maybe a deadline looms to up the ante. But what satisfaction, for client and designer alike, when the last picture is placed, the final t is crossed, and I push the “save” button one more time to seal the deal. Another puzzle has been solved, and the picture is complete. My work has become my play. Let me know if you want in on the game. NextNext post:Are You Up to Speed on Print On Demand?